WinX DVD Author, from Digiarty Software, is a powerful and user-friendly home DVD creation software, which is designed to author, convert, compile and burn DVD from all popular video compatible formats including AVI, MP4, DivX, WMV, Xvid, RM, MOV, and more. With WinX DVD Author, users will be able to convert video to DVD in 3 simple steps, giving users perfect DVD authoring experience with easy manipulation. In addition, WinX DVD Author also comes with numerous customizable video and audio controls, automatically created DVD menu or chapter menu, and creates DVD from digital video recorder, Webcam, or downloaded files. Support both PAL and NTSC. Support adding subtitle to DVD. Support Dolby Digital AC-3 Audio. Support 4:3 standard and 16:9 widescreen TV, NTSC and PAL video. High video quality and fast speed. Support multilingual: English, French, Chinese, German, Italian, Japanese, Spanish, etc. WinX DVD Author is normally priced at $39.95 (aff). As part of time-limited giveaway promotion from softpedia, interested users now can download the full version of WinX DVD Author (v5.5.8) at no cost. 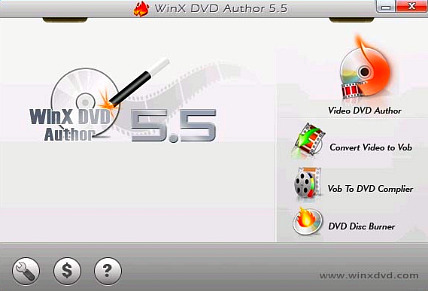 To grab a free copy of WinX DVD Author, users just need to download the setup installer of WinX DVD Author from the promotion page: http://www.softpedia.com/progDownload/WinX-DVD-Author-Download-42198.html. 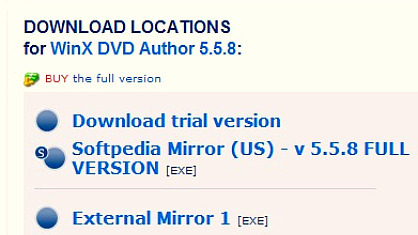 Click on “Softpedia Mirror (US) – v 5.5.8 FULL VERSION [EXE]” to download the full version installer named winx-dvd-author-full.exe. Once finish download, install it to enjoy the full version of WinX DVD Author. The offered WinX DVD Author does not need any license key or registration key to unlock or activate. The new WinX DVD Author is fully compatible with Microsoft Windows 98, NT, Windows 2K, Windows 2003, Windows XP, Vista, and Windows 7 operating systems.